You may be wondering why I am posting another Easter bread when Easter was last week. 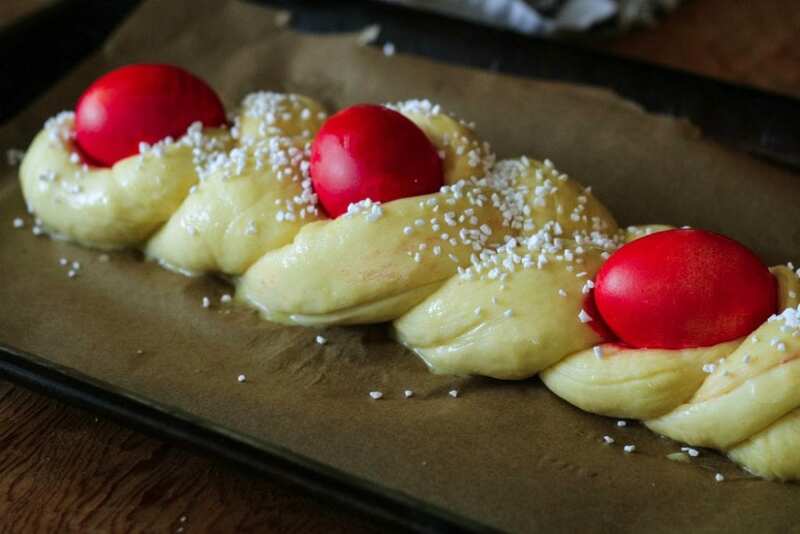 Today is actually Greek Orthodox Easter and I have been obsessing for years to dye red eggs and share a Tsoureki-Greek Easter Bread. I know, it seems silly. Who in their right mind would obsess about red Easter eggs? Me, that’s who! 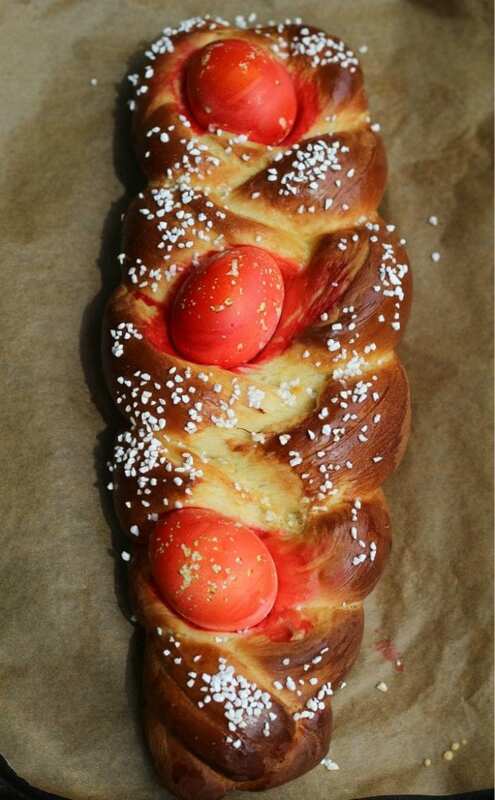 I tried to make this bread a few years ago and used red dye, and I got gorgeous hot pink eggs instead of red and felt very disappointed in myself. I couldn’t understand how difficult it could be to dye red eggs if you’re using red dye. I gave up on my mission to share this bread and stuck to my traditional Italian Easter bread and moved on in my bread baking life. And just to warn you, I have one more Italian Easter recipe to share! It’s taking me a while to upload the photos and edit them. That’s part of the reason why I give up on posting recipes here as it takes me a while to get the photos together and choose the correct ones, edit them, and post here for all of you!! With patience I am getting to them all! Basically tsoureki (tsoo-RHE-kee) is just a soft butter and egg brioche dough like the Italian Easter bread I make. The spices that are used to flavor the bread varies from region to region in Greece (like many Italian recipes). It could be made with kakoule (cardomom seeds). It could also be made using mahlepi seeds (or powder) which can be found online or in your favorite Middle Eastern market (we have a great one not too far from us). I have never baked with crushed mahlepi seeds or its powder, but know it is used in Middle Eastern baking. I decided to use crushed anise seeds in place of the mahlepi seeds, as I wanted to use what I already have here and it is used in some Greek baking. In Greece they color the eggs red usually on Holy Thursday to symbolize renewal, rebirth and the blood of Christ. My Greek friends explained to me that they crack the eggs in a gentle and fun way against each other saying “Christos Anesti” (Christ has risen), and then saying, “Alithos Anesti” (he is risen). My kids did not crack any red eggs against each other because that would just end in a disaster, but they did enjoy sharing this bread with each other on Easter morning. As for the red dye, I did buy a packet of red dye from my local Middle Eastern Market and it worked much better than the liquid dye I used the first time. It takes some time to wait for the eggs to get the correct color, so dye it even a day or two ahead. It also takes some time for the dough to rise. It should be made with lots of patience and love, as with any yeast type dough. You could be wondering why I’m sharing this, as I’m not Greek. But the Sicilian in me must have some Greek ancestry. Ever since I was a little girl, I’ve been fascinated by Greek culture, the language, its traditions. 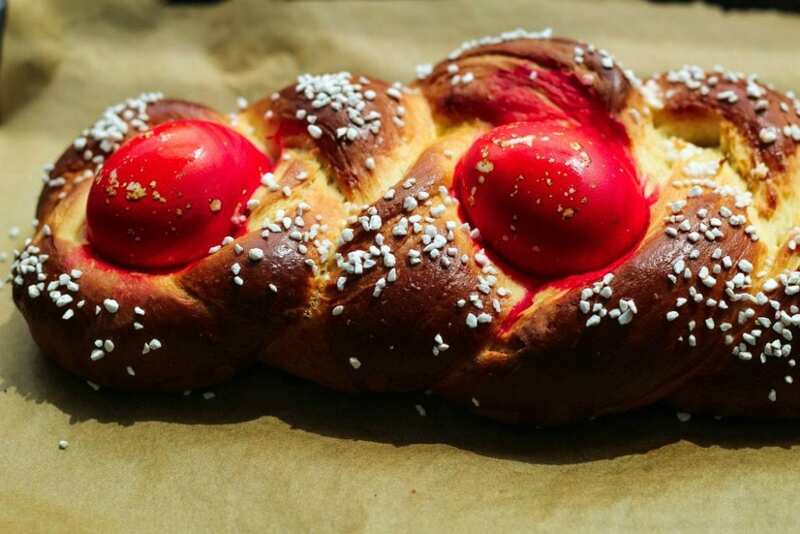 Any Greeks that have a story or more to say about traditional Easter breads, please leave a comment!! I would love to hear from you!! (thank you, Mary!! )And as I mentioned before, I’ve been obsessed with dyeing my red eggs and finally sharing this bread. It took me some years, but I finally did it. 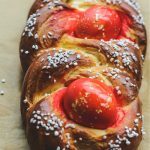 Greek Easter bread – Tsoureki - super fluffy and soft yeast egg-enriched bread flavored with citrus and aniseed. 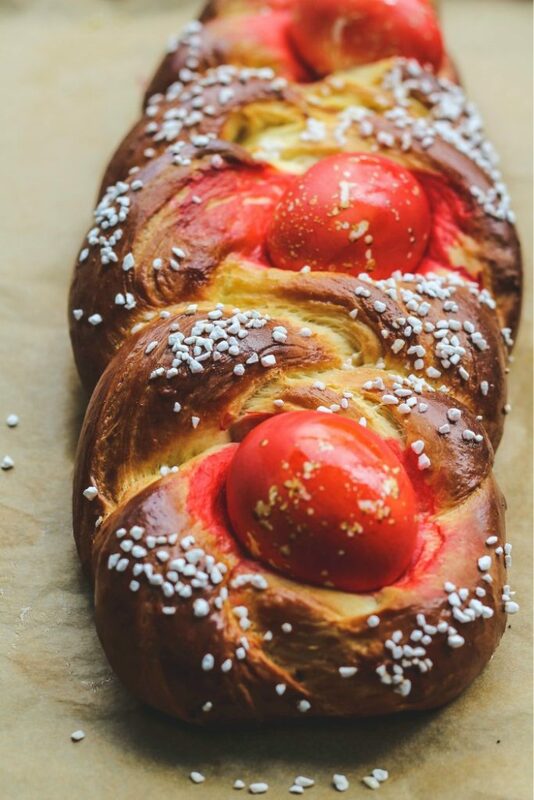 It's a traditional Greek Easter bread, but can be enjoyed any time of the year. In a large bowl whisk together the rest of the sugar, flour, lemon zest, aniseed and salt. Be sure to mix well when all the butter is added (about 3-5 minutes). You may need to add more flour. Don't worry about the total amount of flour, keep adding until your dough is stiff and it is not sticky. Oil a large mixing bowl and place the dough into the bowl.Rub a little oil on top of the dough and cover it to rest in a draft-free area for a bout 1-1 1/2 hours. The dough will be doubled in size. Punch down the dough. If you are making one large braid, roll each piece into strips about 15 “ long. If you are making two braids, the strips will be a bit smaller (sorry, I did not measure the strips).Pinch the left side together to secure the three pieces and braid the 3 strips. Pinch the other side together on the right to secure it closed. The fun part is tucking in the eggs wherever you’d like it in between the braids and cover the dough with a kitchen towel for about 40-45 minutes. I tucked in 3 eggs in each braid. When dough is about ready, preheat the oven to 350 F. Mine was ready to bake at 40 minutes. Whisk together the egg and water for the egg wash and brush it on the dough avoiding the eggs. Sprinkle on the pearlized sugar (if using). Place the dough on a parchment lined baking pan and bake for about 25-30 minutes, or until golden brown. Check on your bread at about 25 minutes, you don't want it too brown. Thanks, Jovina! Hope you had a nice Easter! HI Mary, Thank you for leaving such an informative comment. I have heard that it has to be used sparingly because it could be better. What a great tip on how to crush it!I want to know more about your village sourdough bread. I appreciate your kind comment and thank you for visiting!